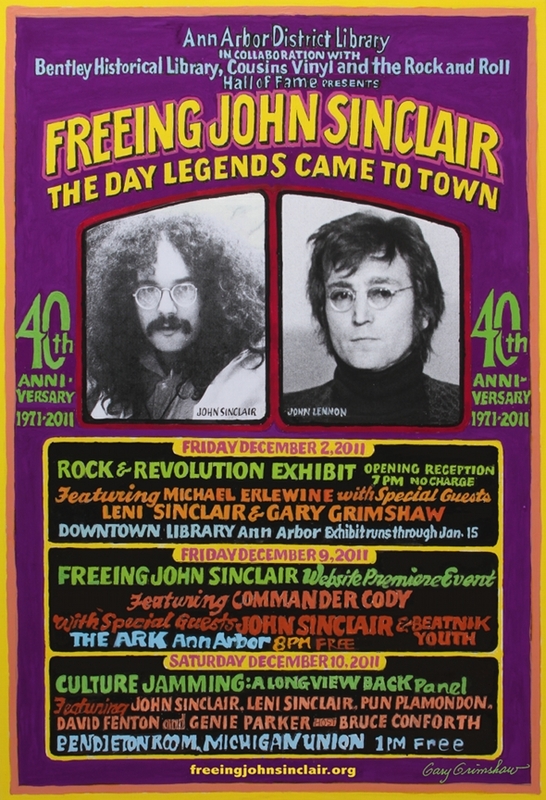 The John Sinclair Freedom Rally, held in Crisler Arena on December 10, 1971, is one of the most memorable concerts in Ann Arbor history and one of the most significant in the history of Rock and Roll, due in large part to John Lennon's decision to appear in support of radical White Panther leader John Sinclair, who was currently serving 8 1/2 to 10 years in prison for the possession of two marijuana cigarettes. But also on the bill that night were Motown's Steve Wonder, folksinger Phil Ochs, and jazz legend Archie Schepp, plus Ann Arbor's own Bob Seger, Commander Cody and His Lost Planet Airmen, Teegarden & Van Winkle and The Up. Speakers included Bobby Seale, Allen Ginsberg, and Rennie Davis. On the 40th anniversary of the Rally, AADL launched this site tracing the history behind the Rally, in particular the story of the White Panther and Rainbow People's Parties in Ann Arbor, through a series of interviews; essays; photographs; historical audio files; and thousands of articles from both the Ann Arbor News and the Ann Arbor Sun, the underground newspaper published by the White Panther Party and Rainbow People's Party from 1967-1976. Highlights of the site include the phone conversation between John and Leni Sinclair and John Lennon and Yoko Ono after Sinclair's release from prison, and our interview with the Honorable Damon J. Keith, Senior Judge for the United States Court of Appeals for the Sixth Circuit, about his famous "Keith Decision" in the CIA Conspiracy case. We also interview former White Panther leaders John Sinclair, Leni Sinclair, Pun Plamondon and legendary poster artist Gary Grimshaw. The essays cover such topics as the hidden history of Ann Arbor's countercultural past and the story behind the Rally. John Sinclair writes about his years in Ann Arbor; Leni Sinclair describes the evolution of the Hill Street commune; and radical lawyer Hugh "Buck" Davis details the Constitutional significance of the CIA Conspiracy case.